Today marks the first day of classes over at the North Carolina Central University School of Law. This photo is on the wall next to my desk in the office. Every single one of them has graduated now. Unable to accept the reality of being so far removed from being enrolled at an educational institution, naturally I had to drop in on Orientation last Wednesday to mingle as part of the law school’s annual professionalism series for 1Ls. One of the young ladies I met mentioned that she had read parts of the blog before starting school.2 Then throughout the night I got a few more questions of a 1L-esque nature, so I thought I’d use them as an excuse to create a new Mailbag entry. Q: What is [this blog]? Apparently people think it’s weird that anyone from NCCU Law has a blog, because this was/is probably the most frequently asked question in the past however many weeks between PBAP, Orientation, and classes starting. I started this website back during my 1L year because frankly I needed something to do. At the time I thought most of my classmates were clinically insane gunners, and the time devoted to running UNCASG only kept me out of trouble but so many days in a month. Then I discovered people were actually reading what was getting written, so I tried to make some of it at least marginally useful for folks who came after me. Q: What does “law:/dev/null” mean? Hopefully you’ll read this website for more than just the outlines! But go to this entry on outlines for the URL. It’s entirely too soon to care about your 1L grades. Trust me. Please. Q: Will you be my mentor?? 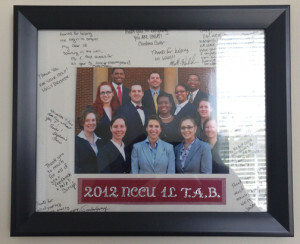 Q: What’s the one thing you know now that you most wish you knew back when you were a 1L? I didn’t discover the contents of the 1L Stuff folder until the first day of final exams during the Spring semester of my 1L year. Rico was reading through a very slick 1-page summary of key issues in criminal law, I asked him how long it took him to make it — because the one I made for myself took forever and wasn’t nearly as nice — and I discovered that he got it from someone else. It was at that point I started asking for outlines and stockpiling as many as I could… then posted every last one on this blog so the information was democratized. Some of my classmates flipped sh*t because I was “making it harder to beat the curve,” but I didn’t want future 1Ls ending up like me with absolutely no clue that the info was out there. I heard I can get outlines and old tests somewhere on here? Will you be my mentor?? What’s the 1 thing you most wish you knew as a 1L? How are you defining your terminology? How did you survive financially? Have you done any advertising? What 3 things would you do differently? Why did you become a solo practitioner? What was your “Plan B” job-wise? What helped you the most 3L year in preparing for post-grad life? If you had to do 3L year over again, what would you differently? What materials did you use for bar prep? Are you bailing on law:/dev/null for Twitter? What are your plans for law:/dev/null post-graduation? Where do things stand with NC SPICE? How does it feel being done with everything? What’s your secret to not being stressed about the bar exam? Do you have any bar exam study materials? You made Dean’s List… but grades don’t matter? Why is NCCU Law’s curve so low? What is the rationale for NCCU Law’s dismissal policy? How does the dismissal policy work? What are NCCU Law’s GPA cutoffs for Dean’s List and academic honors? Do you get notified if you made Dean’s List? Do we really need to study 60 hours a week? My study partners study all day; am I missing something? How time-consuming is being an SBA Representative? Should I use “canned” briefs or create my own? Is law school really just a big head game? What’s the biggest difference between 1L year and 2L year? What made you pursue law after having done computer science? What really made you dislike BigLaw? Why were 2 of the top 4 teams in the K-S competition from T4s? What happened to Tweet-sized Tuesdays and the Friday Drive-by? How did your CivPro I final exam turn out? Do you really send/receive thousands of text messages in a month? How are you adjusting to a historically black university? Are you really a Republican? Did you have a bunch of study materials for the LSAT? How well did you do on the LSAT? How did you do in your election for 1L SBA Rep? Who is in the Gang of Eight? Did your entry about That Guy really happen? Did you really count the lights from your apartment to school? How cool is this? Another solo posts his numbers! Way back in October last year, I threw caution to the wind and posted this entry detailing my first-year revenues and expenses for the law firm, with a follow-up entry answering some of the questions I got. Now I would never claim to be a trend-setter or anything ( ), but I stumbled across a post from a solo practitioner down in Florida who posted his own revenue/expense figures1 — and he gives law:/dev/null a shout as the motivation for it! As part of my preparation, I started combing the Internet for any and all information I could find about starting a firm. I was looking for hard data: what are the costs involved in starting a firm, how much do new solos bring in, what works and what doesn’t when you’re starting out, and so on. Unfortunately, there was almost nothing like that. Instead, nearly everything I found fell into one of two very unhelpful categories: One was the “LAW SCHOOL IS A SCAM! BURN YOUR J.D.! YOU’LL NEVER MAKE IT!” crowd which has taken over many popular law blogs and message boards. The other was very basic, generalized stuff like “Network, do good work and if you make it through your first year, you’ll probably be okay.” Neither was much help. One exception to this came from Greg Doucette, a North Carolina attorney whose blog I stumbled across one day. Greg did something I hadn’t seen any other attorney, new or established do: he put up a one year “postmortem” of his new firm with hard numbers, showing exactly what he made and spent, along with examples of what he did wrong (and right!) that first year and the changes he planned to make going forward. This information was just what I was looking for, and was much more helpful than pretty much anything I had found before. In summary, my first quarter led to approx. $22,575 of income and $8,114 of expenses, netting me approx. $14,461. I’ve taken $6,000 of that as paychecks, leaving my firm with nearly $8,500 in the bank. I know that might not seem like much to a lot of you, but after all the doom and gloom I read before starting out, I’m actually ahead of where I thought I would be at the moment. I’m still networking my tail off to increase my exposure and I know I need to be withholding more money to pay my taxes, but I think things have gone okay so far. I’ll ignore his comment that $22.5K in a quarter “might not seem like much” or the fact he’s averaging over $1K-per-client — I’d (almost) kill for that kind of success — and instead just say it’s freaking AWESOME that someone else is willing to open up their books to folks thinking about going into solo practice! 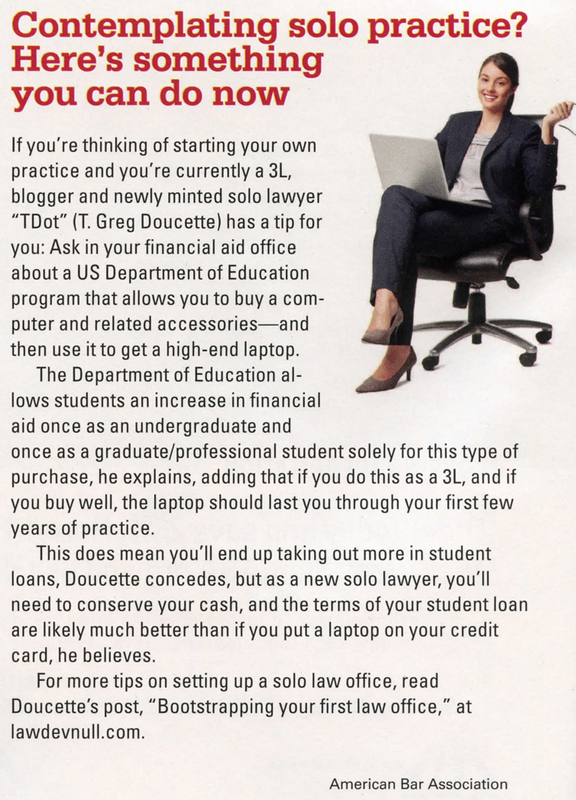 In the latest print edition of the ABA Law Student Division‘s Student Lawyer magazine, law:/dev/null got plugged in the “In Brief” section! If you don’t get the magazine anymore, you can also access it online here (though in my case I politely hounded a 2L for her copy). 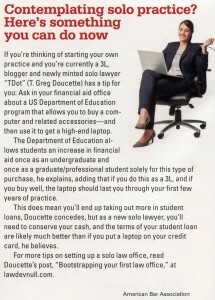 The snippet talks about this TDot’s Tips entry on bootstrapping your first law office, and specifically the Department of Education program on financing a computer purchase. Just had to share Good night y’all! Blawgpocalypse 2.0: Any new law student blawgers? I was flattered to be recommended, but then a little embarrassed that I’d let the blogroll fall into such decay (it hadn’t been thoroughly updated since September ). There were a couple surprises — BrokeJD is back, and imnobody posted briefly before disappearing again — but the moral of the story is that there are surprisingly few active law student bloggers (at least that I can find). Y’all know I like numbers, so here’s some data. We’ve got 194 blawgs on the blogroll as of this entry, which I’ve been collecting since my 1L Fall semester in 2009. 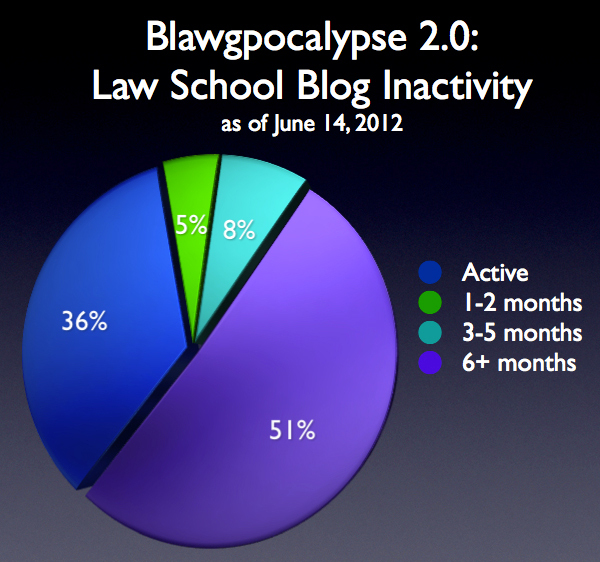 And that doesn’t consider several “active” blogs that now have nothing at all to do with law or law school; if I took those out of the active count, the inactive numbers would climb even more. So now that our blogroll has been updated, the main point for this post: are there any new law student bloggers out there? The insights and experiences of current/former law students are a great resource for prospective and future ones, and I’d love to have everyone included on our list. If you’re a law student blogging somewhere on the internet and you’re not listed on the right — or you’re reading someone’s law school blog and it’s not there either — please consider posting in the comments or sending me an email (tdot [at] lawdevnull.com) so I can fix it! That’s it from me for tonight, I’m off to go watch some more BarBri lectures and keep grinding away on multiple choice questions. Have a great night y’all! Bar prep has been underway for a couple weeks now at NCCU Law, and is sufficiently voluminous — not difficult per se, just voluminous — that I’ve had to put off working on the May blog backlog because evidently I remember just about nothing from my first year of law school. But I am determined not to let this stuff run my life all summer, so I switched gears and spent today working on the IRS 501(c)(3) app to for NC SPICE and going through some entries in the blogroll1 — and came upon this entry at The Human Lorax linking to this list about bar prep over at Legally Noted. The list is a bit profanity-laden, but anyone studying for the bar has probably thought most of these at least once. Check it out when you have time! Just over a week ago I mentioned that things were still operational here at law:/dev/null, but had fallen into some pretty bad disarray after me being gone from active writing for over a month. I’ve started scrubbing through some of the old logfiles to deal with the spam issue, deleted out all the spammy pingbacks (plus the internal ping backs generated by our own entries), and finally got all the April entries prettied up and published. Thanks for your patience as we get the blawg back up and running — have a great night! Worse, the blog backend is in total disarray: the .htaccess list hasn’t been updated in ages so the spammers are back, our error message plugin evidently broke with an update some time ago and I didn’t even notice until yesterday, and the blogroll is more-than-a-smidge outdated. I’m still here, and law:/dev/null will still be here too — there’s bar prep to write about,1 and if nothing else I’ve got about a half-dozen entries in varying stages of completion I need to finish and post — but it’s gonna take some work. Just wanted to post a quick message saying hello and letting y’all know I haven’t totally disappeared Have a great night! Not much time to post anything substantive tonight — I’m grinding away trying to finally wrap up this entirely-too-long semester — but wanted to give y’all a heads up that some changes will be coming to law:/dev/null over the Christmas break. First, I’ve resumed the process of going through old posts and adding the appropriate tags to them, so old entries will finally show up when you click a tag in a recent post. For whatever reason I didn’t start using tags until several months into blogging so there’s a bunch of them to go through But for the several 1Ls and pre-Ls who had sent messages asking where all the stuff was from my first year (like the Torts mixtape with bonus Ks track) because going through the overall category took forever, the tagging process should make life a little easier. Also, as we’ve banned more and more spammers the site has slowed down from parsing the ever-growing .htaccess file. Average load time is hitting 2-3 full seconds ( ) which is an order of magnitude slower than where I’d like it to be. I’m not sure yet how I’m going to fix it, but wanted you to know I’m aware of the problem and will see what I can do. That’s it for now, back to these papers. Have a great night y’all!